The Story Behind ‘Easy Button’: As you might be able to tell, I went to Staples for my office supply inspiration. I have always loved their easy button, and as a result, it made designing this quilt easy. I bought crayon fabric for the quilt, but as you can see, it played a very small role – the binding and little crayons in the paper clips were an afterthought. The rest of the quilt is from my stash. What amazes me about Staples is all the choices of common items, like paper clips and tape. Since making decisions is sometimes difficult, I put the easy button in the middle of the several choices of paper clips, crayons, and tape dispensers and added a hand to push the easy button. The crayons and tape dispensers are iron-on applique. The paper clips are satin stitched. The easy button has machine embroidery for the word (the font was perfect!). I used plain red fabric but added the shading with paint. The button is also slightly padded. The hand also had shading and details added with india ink. The finished size is 22 1/2" x 23". The Story Behind ‘Flower Power Dolly Blanket’: The inspiration for my dolly blanket was all the bright colors of the new school supplies, a folder, white poster board, and a quilted backpack. I started with 2 pieces of cotton fabric I had gotten awhile back at Walmart. They are supposed to be big dish towels, but I loved the texture and knew i could do something with them someday. They came in a big package of 5. After ironing them out, they looked and were about the size of white poster board. I cut one piece in half, sandwiched it with some batting and quilted it. I quilted in a diagonal manner like the way the backpack I saw was quilted. I really like how it looks as I usually stipple everything. I then heat bonded a bunch of solid colored fabrics, traced out my flowers, cut them out and ironed them onto my quilted surface. The butterfly wasn’t on the folder, but I thought it would blend in nicely. I then free-handed the remaining flowers that were going to be just stitched. After adhering all the flowers I matched thread and sewed over the flowers. I stitched several times around not going over the same line of stitching as I wanted it to look like doodling. As I was finishing all the doodling, my machine decided she had had enough and i spent about an hour trying to figure out what was wrong. Before taking a sledge hammer to her, I got out my baby Janome (which is like a kids sewing machine) and sewed on the ribbon border. I wanted it to be nicely couched onto the quilt but my janome only does a simple zig-zag. This piece measures 22 x 16 and was fitfully made in water-logged Elgin, IL. The Story Behind the Rat eRace: In my trip to the office supply store I got to thinking about years ago when I worked in a cubicle. I always felt like cubicle office spaces are like mazes, which is in some context appropriate for the term "rat race." Since I like making labyrinth quilts, it seemed the perfect fit. I created a miniature design of 1 inch blocks, 22 per side (484 total little squares). I mixed up black and gray squares to give a sense of different spaces within the office. The quilting is simple ditch stitching around the white path walls. At the office supply store, I bought several black felt erasers (dry-erase), and several packs of white rubber erasers (for battery-powered erasers), plus a pack of cork tiles. I cut the felt to create cubicle walls, and used Fabri-Tac to adhere them and the rubber erasers to the quilt. The rubber erasers serve kind of a dual purpose as windows or counters/partial walls. The lady at the store looked at my 4 felt erasers and 120 rubber erasers and said "You planning on making a lot of mistakes?" I used Fabri-Tac to adhere the cork borders, then adhered strips of wood lattice on the back, to give it a hanging structure and protect the cork from breaking. The final piece is 27 1/2" square. The fabrics were from stash, so the total cost with erasers, cork and wood came to just under $30. Created in the heart of cubicle country, Fairfield County CT. The Story: My inspiration came from a composition book with a "recycle" theme, some envelopes and some fun pens. I thought this quilt is perfect to keep your letter writing supplies all together and would be great to send to college with your student as a "hint" to write home! There’s a spot for the notebook, this will fit a regular spiral bound notebook or a composition book. 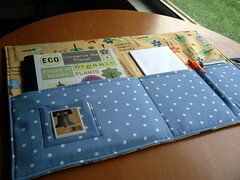 A spot for your envelopes, a pen, stamps and one extra spot (checkbook sized) for your address labels. Closed – 10" x 13"
Open – 20" x 13"
The Story Behind “Just a Few Drips”: After strolling through the office supply store I remembered they do have art supplies, too! Having been an artist long before I ever became a quilter I thought I would take that route. 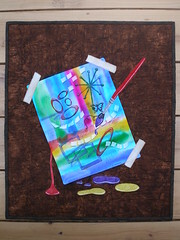 I chose to use paint, paper, a paint brush and masking tape in my project. However, everything you see is either fabric or paint, nothing else. The "fabric" paper is 3D and is only held down by the "fabric" masking tape on 3 sides. I painted on the fabric and did everything else in raw edge appliqué. I found a great fabric for the background that looks like a wood table so I quilted it in a similar design to make that stand out. It measures 17.5"x21"
My daughter loves this one and has already claimed it. The Story Behind ‘Quilting TO DO’: I had quite a challenge this week, as both of my main sewing machines were out for service, and my remaining machine is deployed to a quilting frame. So I decided to see what I could accomplish sans machine. My inspiration was colorful reams of paper, post-it notes, and paper clips. I decided to lay out 4 sheets of colorful paper to determine the finished size (17" x 22") & used a background fabric that reminded me of the vibrant colors. I then "stitched" and "taped" the sheets together using a silver rayon thread and "cellophane tape" that I made from sheer drapery fabric & cut with my pinking shears. I then used a buttery yellow fabric & fusible to make 1.5" x 2" "post-it notes". 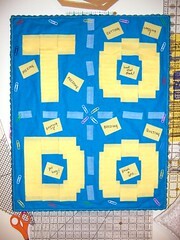 From the fabric post-it notes, I created some post-it art that spells out "to do", then I scattered handwritten notes around the letters for all the quilting tasks that need to get done. 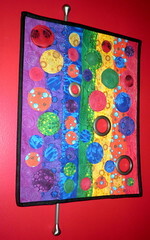 I used colorful paper clips (those are real) and hand stitched those into the border and the center of the quilt. Once the quilting and embellishing was done, I mounted the quilt to foam core, backed with felt so it can be used as a mini design wall. Then I used a matching trim and hand-stitched it to form the binding (through all 7 layers – top, batting, backing, foam, felt, plus 2 layers of the trim!) with a heavy-duty needle. Phew! I think technically it’s still a quilt, although a rather stiff one! 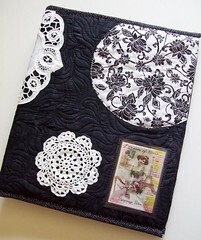 Everything was from stash, including the foam core, and the quilt was made in Hainesville, IL. The Story Behind ‘Elise’s Growth Chart’: From my visit to the office supply store I bought Key tags, funky shaped paper clips, plastic page protectors, plastic photo protectors, a dry erase board, a composition notebook, colored pencils and stickers. I made a Quilted Growth Chart for my granddaughter, that doubles as an art center. I made it out of leftover fabric from a bunk bed tent that I made for her, so they will coordinate in her bedroom. It measures 20" x 40"
I started with the main focus fabric that has castles and good fairies on it, and lots of pink (she’s 3 and that’s her favorite color). I added a pocket on the bottom that can hold her coloring supplies. I sewed a plastic photo protector to the front of the pocket to display a favorite photo. 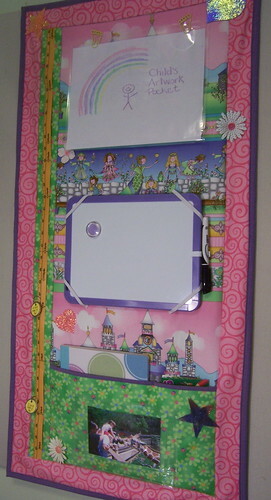 I added elastic bands to the center of the main panel to hold the removable dry erase/magnet board. On top I attached some funky shaped paper clips that can hold a page protector that has her artwork in it. To embellish it, I fused together some Angelena fibers to make little sheets of new "material" that I then cut into heart and star shapes with my Accuquilt Go to attach for some fun, sparkles. And I sewed on some fabric flowers and added button centers. 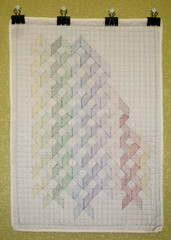 The Story Behind ‘Doodle Quilt’: This whole cloth quilt measures approximately 15 1/4" x 21" after quilting. It’s based on a doodle I often draw in the margins of my paper. Some of my favorite office supplies are graph paper, colored pencils and binder clips! I thought the binder clips would be a handy way to display small pieces that you’d like to switch out frequently or somewhere like a cubicle that wouldn’t allow a permanent hanger attached to the wall. First I created a double sized piece of graph paper by quilting a 1/2" grid with light blue thread on a piece of 16"x22" white solid cotton (with batting and the same fabric for the back). I triple stitched the outer border so it would appear darker as on typical graph paper. Then I used grey thread as my initial pencil shape outlines, then "colored" those in with a variety of colored threads. For the appearance of extra dimension, segments going from top left to bottom right are "colored in" about 2 stitch lengths apart but just 1 stitch length apart for segments from top right to bottom left. 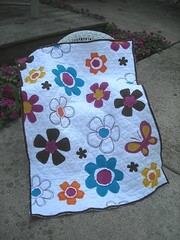 I bound the quilt with the same white fabric and slightly rounded the corners for a softer appearance. I like to use the Project Quilting challenges as a chance to try something I haven’t ever done before! This is my first whole cloth quilt and my first time doing any sort of thread painting. I create in Colorado. This weeks randomly drawn public prize will win a triple strand cuff bracelet in retro ruler fabric shown below from PonderandStitch! Read below on how you have seven chances to win! SEVEN Chances to WIN! Entry 1: REQUIRED! Leave a comment on your favorite entry (or at least that you voted) and vote for your favorite on the poll on the upper left hand side of the blog. – ***MUST DO*** Optional/Additional Entries – please note – if you want to qualify for these additional entries you must leave a SEPERATE comment for each – if you already follow or are a fan, etc just leave comments saying each. If you write everything in ONE comment you only will have ONE entry… Entry 2: Follow my blog. 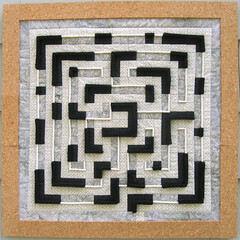 Entry 3: Tweet about this fantastic contest with hashtag #PQoffice(important or I won’t know you did it) Entry 4: Become a Fan of Project QUILTING on Facebook:http://www.facebook.com/ProjectQUILTING Entry 5: add my Project Quilting ‘Grab my Blinkie’ to your blog or blog about my giveaway (link your blog or post in your comment, please) Entry 6: Head on over to PonderandStitch and let me know your favorite item in the store! Entry 7: Sign up for my newsletter in the upper right corner of this page! 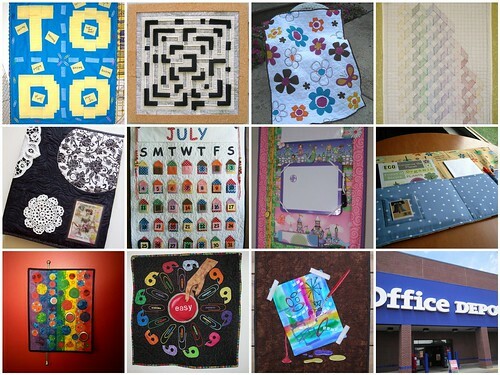 ***Participants in project quilting ARE allowed to enter in the public poll/contest as well. *** ***Only open to those in the US*** This means you have SEVEN chances to win! I need you to write each of these entries as different comments in order to qualify you for all seven entries and include your email address. If you don’t include your email address I won’t be able to contact you when you win and I will have to choose a new winner. I will be picking the winner on Saturday, July 31st. love the quilt with paper clips–had been thinking of doing something about the darling paper clips my grandson and i picked out a couple years ago to use as stocking stuffers–they were in all different colors and shapes. so was intrigued when i saw she'd used same sort of idea. I was really looking forward to seeing what people came up with for this weeks quilts!! 1)I've never even heard of ACT's. Oh My I cannot wait to get started on these. I'm going to blog about it tonight! 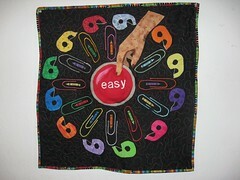 2)The Easy button…GREAT inspiration and Fun!! 4)I was hoping someone would really use the ACTUAL office supplies. Very cool! 5)what a neat organizer. Perfect for college season! 7)Another ingenious idea using actual materials…and even harder without her machines! 8)I have made many growth charts. Yours is awesome. Great ideas! I love the key tags idea. 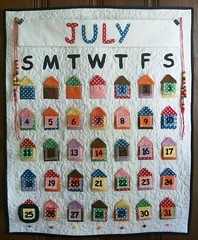 9)Cute calendar, especially the pink because she can! 10)My fave about this is that she thought outside the box and did two new things she had never done before. That's what a challenge is all about. Sewing graph paper is cool! OK..so that was a long post, but this was my fave challenge and I had to say something about all of them! I am a fan on fb. I even made a comment this morning. I love stationery stores – all the colors and the neat little things … it is almost as addicting as fabric! All the entries are great, so as usual I had a hard time narrowing down my choice to just one. I voted for Sarah b's graph paper and doodle piece. My favorite item at Ponderandstitch is this one – http://www.etsy.com/transaction/31956968 – the cuff reserved for Kim, because it is so appropriate for sewers and quilters. I signed up for the Crafty Apple newsletter. I voted…I was so sad not to have a quilt entered this time, but at least it was fun to vote. Oh, all the entries were really great, good job everyone!! I voted! great challenge….though I do agree with Hillbilly Handiworks, I wish there was more actual office supplies used! You know how much I love mixed media pieces *grins* Hmmmm maybe I should enter one sometime. Though I've never actually made a quilt…. yet. Wow! All of the of the entry's are fabulous. So hard to just vote for one but I did pick one. 1. Voted! Gosh, they're all so great, but Kim, I'm loving the circles and the bright colors that you chose! 4. I'm a fan…of course! I'm a facebook fan Project Quiltings page. I'll also tweet about it. I voted! These are all wonderful and it was hard to choose. I voted – LOVE the crafty growth chart! I joined the FB fan page and left a comment. How cute are those bracelets! I love the seafoam floral … very pretty.